For fans of the original series, Jim Henson’s The Storyteller: Sirens #1 is good for the kids and for the inner-child. It’s simplistic, but worth a look. For too brief a time in the late 1980s, The Storyteller showcased relatively obscure folktales for television audiences worldwide. Though the show only went on for 13 episodes (including the sequel series Greek Myths), its legacy lives on to this day. This includes a television reboot currently in the works, and a novel adaptation. There is also a set of graphic novel miniseries’, each an anthology featuring a particular creature of fairy tales and mythology. So far, the series has covered Witches, Giants, Dragons, Fairies, and most recently, Sirens. 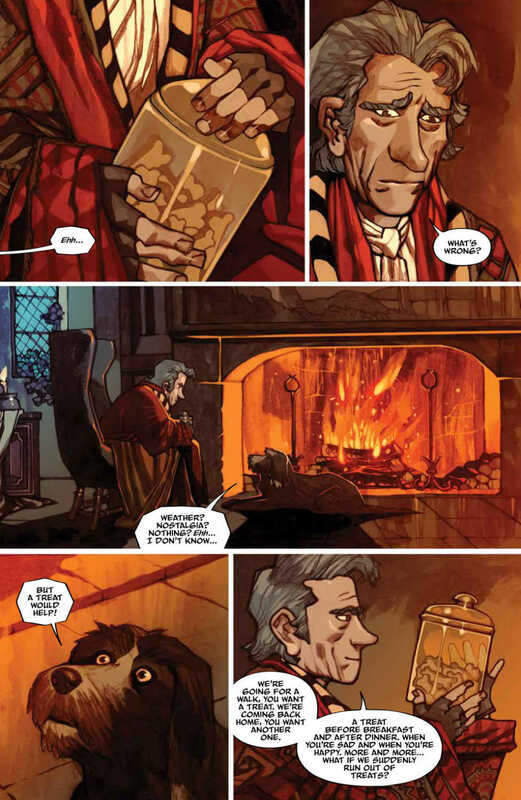 In the first of four stories from Jim Henson’s The Storyteller: Sirens, writer Sztybor Bartosz does solid work in setting the tone right from the beginning. Once the story moves from the introduction by the Storyteller, and into the tale itself, it’s a somewhat rigid structure, reading more like storyboards than a graphic novel. The story is a much more toned down version of its source material, but still manages to maintain its message. The fisherman longs for happiness, but cannot find it in his work, nor in his family. When he finds the siren, he is captivated by her singing, so much so that he puts her under lock and key, so that only he hear her song whenever he wanted. It brings him some joy, but at a cost. Bartosz captures themes of obsession, gluttony, and taking things for granted, all in a 20 page comic geared toward children. The ending in particular will tug at the heartstrings, no matter the age of the reader. Like the writing, the artwork isn’t the most innovative. 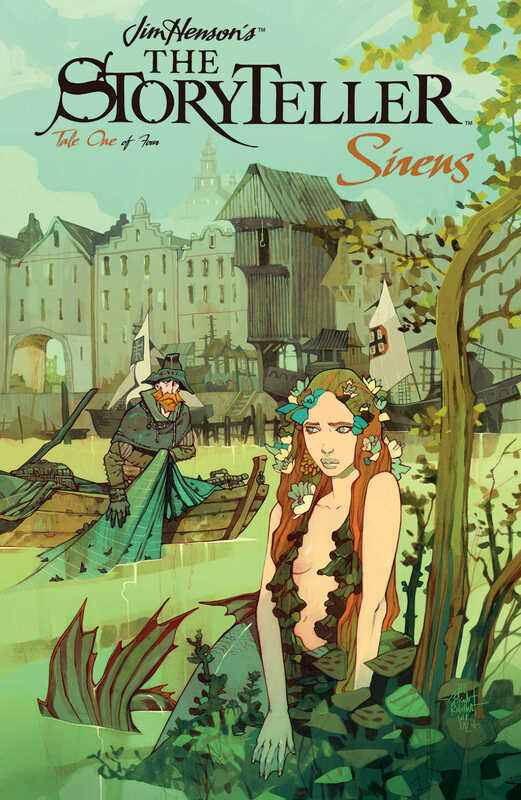 Jakub Rebelka’s work might been more effective if he had taken some creative liberties. He could have used a more fantastical approach to the visual storytelling and worldbuilding, as opposed to simply illustrating it word-for-word. The characters have a distinctive look, like something out of a children’s book, with long faces and oversimplified expressions. 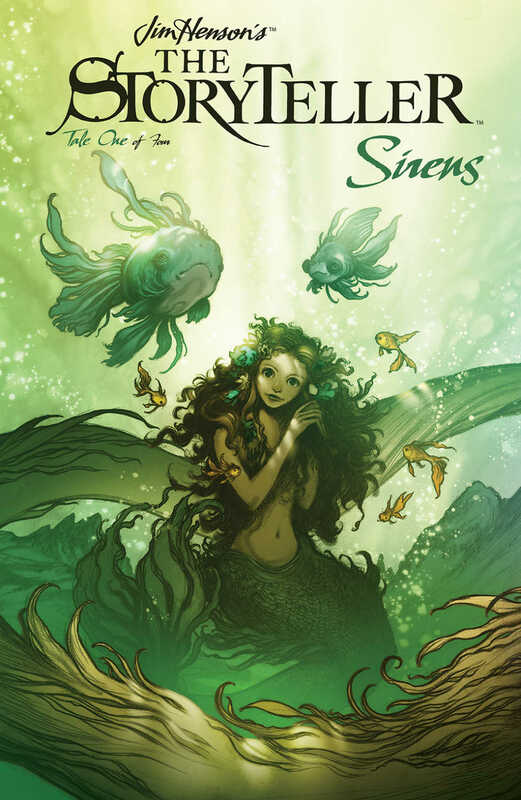 What stands out in the artwork of The Storyteller: Sirens is the coloring, with each panel tinted in shades of blue and green. It gives the story a wet and dreary undertone as the fisherman struggles to find happiness. This is contrasted by the warm red and orange tint in the Storyteller’s den, feeling as if we are right there next to him by the fire as he shares his tale. 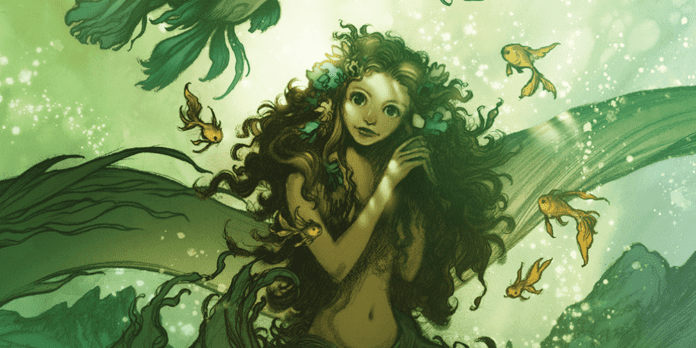 For fans of the original series, Jim Henson’s The Storyteller: Sirens #1 is great for the kids and for the inner-child. It’s simplistic, but worth a look. Are you ready to dive back into the tales of The Storyteller? Share in the comments!